Rithika Homes undertake housing construction in and around Chennai & contracting business. The Company traversed a path of steady growth & expansion with our working styles, unmatched consistency, and giving a close attention to trends and focus relentlessly on the new up gradation in technologies. We are committed to provide the best homes and apartments without compromising on quality. All projects are designed precisely to meet the customer's needs, and at times even offer more. 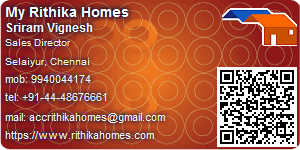 Company: My Rithika Homes Pvt. Ltd. 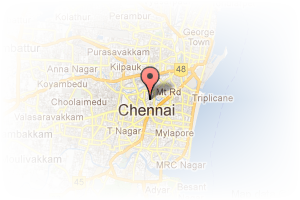 Address: No.16, Ag Complex, Ground floor, Ezhilnagar main road, Selaiyur, Chennai, Tamil Nadu, India. PropertyWala.com » Chennai Real Estate » Chennai Builders / Developers » My Rithika Homes Pvt. Ltd. This Builder Profile page for "My Rithika Homes Pvt. Ltd." has been created by PropertyWala.com. "My Rithika Homes Pvt. Ltd." is not endorsed by or affiliated with PropertyWala.com. For questions regarding Builder Profiles on PropertyWala.com please contact us.